Meeting these market demands goes beyond delivering rapidly growing supply to countries and regions such as Mexico, Brazil, Chile or the Caribbean. 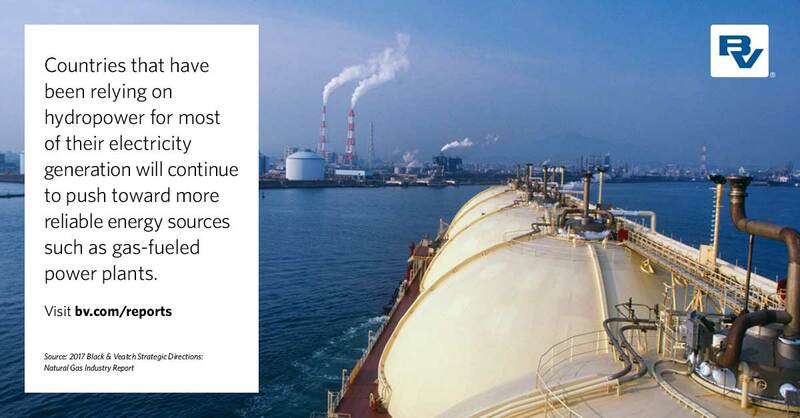 Organizations increasingly are considering the opportunity to support the transition toward liquefied natural gas (LNG)-based power alternatives. Too often, however, those aspirations are challenged by insufficient infrastructure and investment, economic instability and inadequate regulatory frameworks. Recent reform and a shift in economic and energy policy in Mexico, Brazil and Argentina are attracting foreign investment and development. International firms are teaming to develop the entire energy project, from LNG import and regasification terminals to electricity generation in an “all-in-one” approach that addresses the internal LNG demand among users (power plants) along with the necessary importing infrastructure. According to a 2018-2035 plan published by the Central American Electrification Council (CEAC), LNG-fired power plants will contribute up to 43.7 percent of the region’s expected 11.12 GW capacity growth by 2035. High electricity prices, particularly in the Caribbean, and droughts in Brazil, Colombia, Chile and Venezuela that affected hydropower production and resulted in electricity shortages highlight the importance of gas for power generation within those economies. That trend likely is the reason respondents to Black & Veatch’s 2017 Strategic Directions: Natural Gas Industry Report expect Latin American and Caribbean nations to increase their imports from U.S. LNG supplies over the next five years. The small market size of individual Central American and Caribbean countries has presented a challenge in the past when justifying investment for LNG infrastructure. Although this was certainlya strong factor to consider a few years ago, today’s impact may be lessened because of the increasing availability of low-priced LNG from the U.S. Gulf Coast. In addition, LNG suppliers are looking for new markets for their LNG, and these medium-sized opportunities are becoming more attractive. As more import terminals are built, the hub-and-spoke concept can be leveraged to make LNG available to markets where it was not economically justified in the past. Even as oil prices remain low, the lure of LNG’s environmental advantages is expected to intensify the growth of natural gas in regions where governments are eager to meet constituent demand for lower carbon footprints. Countries that have been relying on hydropower for most of their electricity generation will continue to push toward more reliable energy sources such as gas-fueled power plants. Financing for projects and infrastructure in emerging economies in the region remains a challenge. Even though most of the projects are relatively small in scale, they still likely would exceed the financial capabilities of the public sector. External financing would be the most likely option, creating opportunities for private sector companies to develop, own and operate the entire project from LNG fuel supply to power generation. Some organizations are making the leap themselves. AES Corporation signed an agreement with ENGIE late last year to jointly market LNG in the Caribbean from AES’ Andres regasification facility in the Dominican Republic. Most recently, the two companies entered into a joint venture that will utilize AES’ Costa Norte LNG terminal under construction in Colon, Panama, to market LNG in Central America. The AES Costa Norte LNG terminal is being built to supply the 380 MW combined-cycle gas turbine (CCGT) power plant that AES is building. This concept demonstrates the synergies and growth leverage that are possible when a company builds a gas-fired power plant and LNG regasification terminal then uses the hub-and-spoke concept to market LNG to smaller players. The smaller users now have an opportunity to convert their diesel-fueled power plants to gas. These plants also can operate in dual-fuel mode, which provides price and supply flexibility. Single development group projects, where a company or joint venture invests, owns and operates the entire power generation concept (power plant and LNG import and regasification terminal), seem to have better chances of success. This means that a company that is traditionally an investor or operator will now assume risks for all aspects of the project. To be successful, project owners leverage the use of external expertise across the power generation and LNG import terminal and regasification sides of the project.